The Dog Coyote battle page does a decent job of telling the story via the web medium. 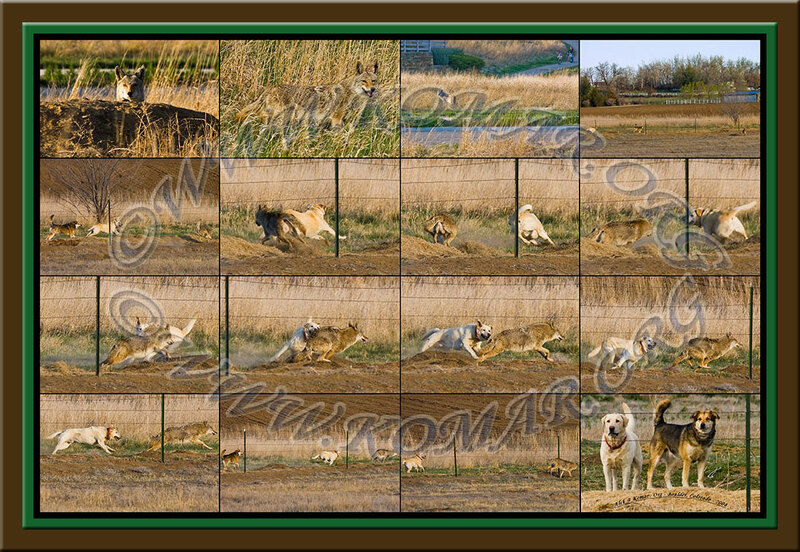 Several folks have inquired about buying prints, so I made an artistic collage that captures the saga using the 16 pictures below assembled into a 4x4 matrix. The screen image below doesn't do it justice - a 12x18" print looks great and when I stopped by several framing stores, folks were calling their co-workers over to see it. Typical comments were "amazing sequence, makes me feel as if I was there, awesome because it's so big & so crisp, way to go [dogs] chasing that Coyote off." I plan to have a 20x30" printed (it will still look sharp at that size) and it should look spectacular framed.